Discover Parmigiani’s Kalpa Qualité Fleurier, which is distinguished, among other things, by its intricate tonneau shape. There’s a curious aspect of the human condition that sees us wanting to separate ourselves from the next person. We will work with each other tirelessly to progress humankind, but when it comes to how we present ourselves, we forage long and hard to be different. You see this manifest in the sartorial realm; the same, too, in automobiles, properties and watches. Watches are deeply personal and, as a result, part of the reason I love them. There is always a story. It’s hard to quantify the human lust for the unique, the different, the off the beaten track, aside from the obvious requirement for the ego to be satiated. And for me, Parmigiani Fleurier offers this in abundance; a manufacturer widely regarded to produce movement and case finishing to match anyone. The watch we have before us is the majestic Kalpa Qualité Fleurier. It is not a round watch (as you may be able to see). All too often, our default setting when considering a watch is to go with what we know – a round case. I urge you to be bold and consider a timepiece that those who have dedicated themselves to understanding the art of fine watchmaking will salute you for. The Kalpa Qualité Fleurier is not an obvious choice and, as a result, you will struggle to find a tonneau shape with as much flair. 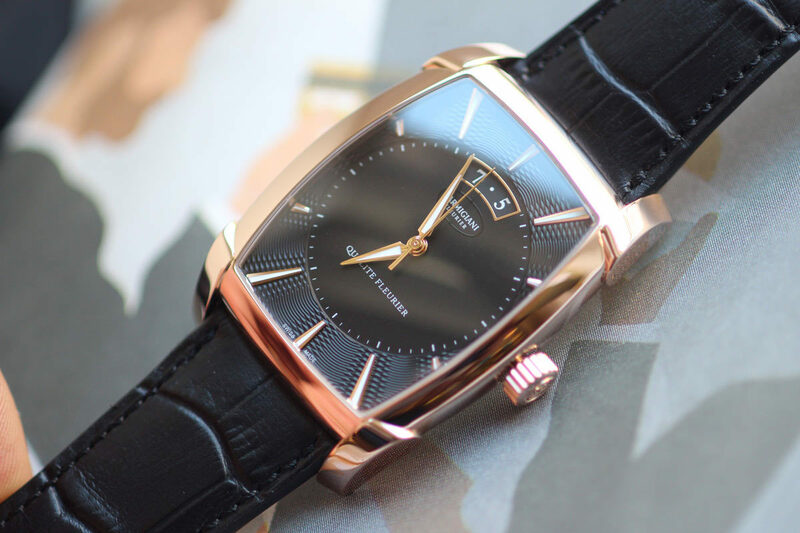 Parmigiani Fleurier is one of the few manufacturers that produces a shaped movement. The Kalpa collection launched in 1998 was the first tonneau shaped movement from the manufacturer. The case is 18ct red gold and 28.7 x 35.9mm, with styled lugs that exaggerate the shape, which I happen to adore. The black dial, which features an opaline and hand-guilloché decoration around its edge with a braid-effect pattern is sublime. This Kalpa is equipped with the new Fleurier self-winding calibre PF442, which features hour, minute and central seconds indications, as well as the date at 12 o'clock. This movement houses a series-mounted double-barrel that guarantees a better distribution of energy within the calibre and increases its power reserve to 60 hours. The bridges on the movement are decorated with a crossed Côtes de Genève pattern, reflecting the rigour of Fleurier Quality certification. For those unsure, the Fleurier Quality certification was co-founded by Michel Parmigiani, is open to all Swiss mechanical Haute Horlogerie manufacturers, and evaluates the watch as a whole, including the quality of the decoration. This includes testing the movement and the operating reliability. The Kalpa Qualite Fleurier is undoubtedly a beautiful watch, from a manufacturer you simply won’t see in the wild all too often. Be bold. Step out of your comfort zone. You will thank me later. For more information, visit Parmigiani.com.